Have you every heard the story about the guy who bought a locked safe at an auction? He had a feeling that there was something really cool inside the safe, but he tried every way he knew and could not get the darn thing open. So he finally breaks down and calls a locksmith to get it open. The locksmith comes in, takes a quick look at the safe and goes back to his truck to get his tools. He comes back with a hammer and briskly taps the safe in the upper right hand corner. Like magic, the safe door swings open. He then says, “that will be $150, please.” The guy is shocked, “$150?! How do you figure that? !” The locksmith says, “$25 trip charge and $125 for knowing where to hit the hammer.” This story is a great lesson, not only in real estate, but in life. Sometimes just because something looks easy, doesn’t mean it is. Don’t undervalue knowledge, especially the kind that can only come from first hand experience. Most people will buy 4-6 homes in their lifetime. A Realtor® may assist in 3-5 home purchases a month. See where I’m going here? It’s hard to put a dollar value on knowledge and experience, but when something goes wrong and your Agent handles it in 15 minutes, that knowledge is priceless. Trends, regulations and laws change frequently and real estate transactions can be complicated, so having an Agent on your side with their “hammer” is always in your best interest. Because your Agent buys and sells homes every day, he or she has a plethora of contacts for anything and everything related to a house. Any kind of service you might need for your home, both at the time of purchase and in the future, your Agent has a rockin’ contact list of who to call (and sometimes, more importantly, who not to call). Who do you call for the inspection, title work, foundation repair, survey, loan, insurance, structural engineer, pest control, fireplace repair, handyman services and more? No worries, your agent knows who to recommend and the providers have been tested by the Agent and the Agent’s prior clients, so you’re not just picking a random number from the phone book, you’re going with the surest bet. There is much more to a real estate transaction than flipping through available properties on the Internet and picking one. Nobody wants to overpay or under price (at least, nobody I know). Your Agent has your best interests at heart and can help you navigate the waters when it is time for negotiation. When buying a home, your agent can protect you from overpaying for a home. Similarly, if you are selling your home, your agent will help you price with current market conditions, based on similar sold home data (also known as “comps,” which is short for comparable sales.) According to the National Association of REALTORS® 2014 report, the typical For Sale By Owner (FSBO) home sold for $184,000 compared to $230,000 for agent-assisted home sales. Yes, you’re paying commission vs. FSBO, but your agent does the work and you walk away with a bigger check at closing—that’s a WIN any way you look at it. A real estate transaction is one of the biggest financial transactions you will ever make and it comes with a big ole bag suitcase of emotions. You may experience all kinds of emotions during the transaction—it is completely normal, as there is nothing more personal than when “home” and money mix. It is human nature–even the most level-headed thinker may get cloudy judgment when his home is at stake! However, your Agent will keep things in perspective and make sure your decisions are being made based on reason instead of pure emotion. Logical decisions now will save you from a lot of regret later. Don’t know the difference between a BPO and an appraisal? What is a HUD and when will you get it? What is a structural engineer and how much is it? Was that a sump pump? All will be revealed when your agent assists you in sorting through the noise. Contrary to popular belief, most of an Agent’s job happens after you find the perfect house and is done quietly behind the scenes, without any fanfare. Your real estate agent is your partner and confidante in the biggest financial purchase of your life and it pays (in dollars, cents and sense!) to have a trusted adviser working on your behalf. You want a knowledgeable ally in your corner and more often than not, at the end of the deal, you’ve made a trusted new friend too! 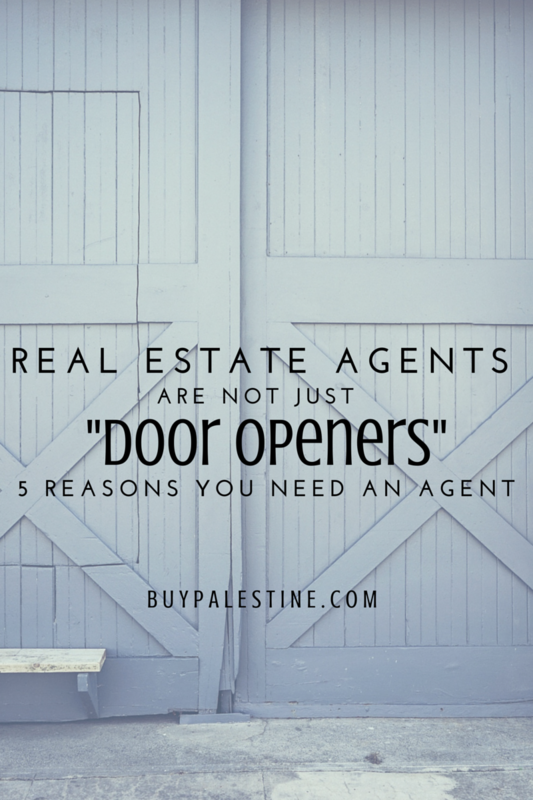 Real Estate Agents do so much more than just open doors—we truly deliver the keys. This article was also published in the Palestine Herald Press and is written by Lisa E. Priest, who has a funky purple hammer and is a Palestine, Texas REALTOR® with Picket Fence Realty, Inc. You can reach her via phone or text at 903-948-3343 or read more at BuyPalestine.com.